Even in death, the fake news media pushes this lie: Bush #41 was so “out of touch” that he didn’t know what a common grocery price scanner was. This has been a particular, pernicious lie about President George H.W. Bush that the liberal media has been pushing since the 1990s. It is a lie that has been debunked over and over. And yet, with his death today at 94, the media is once again trotting out this lie. The fake news story goes that George H.W. Bush was “amazed” at one of those grocery store price scanners that we all see used every day to scan a price tag and ring the items up for sale. Back in the 90s, the media widely proclaimed this story as evidence that Bush was a “rich white guy” who was “so out of touch” with America that he had never been into a grocery store to see such a device in action. The liberal media used this lie to pound Bush as unsuitable for re-election in 1992. He was out of touch, they said because the scanning devices first started hitting stores in 1974 and if Bush was still “amazed” by it as late as 1992, then he must live a cloistered, privileged life. It was a way for the media to tell the country that “George Bush isn’t for you, America” without directly saying that. The story became all the rage for the liberal media. 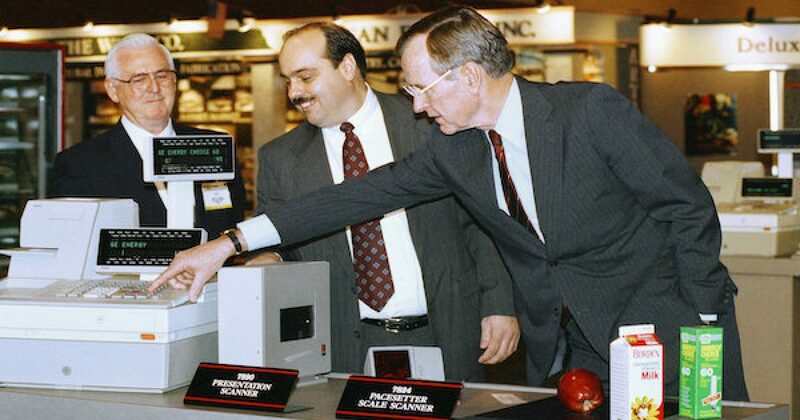 George Bush, so out of touch that he had never seen a price scanner before. But it wasn’t true. The story was wildly exaggerated from the truth. What really happened is that the “amazed” line was extrapolated from a pool reporter who said Bush had a “look of wonder” as he watched a demonstration of a scanner at a grocery industry convention. But Bush wasn’t being “amazed” at the mere existence of a price scanner. He was being “amazed” at what was then a revolutionary new scanner that not only could weigh produce on the spot, but could also read the price from barcodes that were smudged, torn, or missing parts of the barcode. Bush knew what a price scanner was the whole time. He was being dutifully impressed by a new version of the device. But the lying media took it out of context so they could attack him. Perhaps unsurprisingly, the media is still using this fake news story to smear Bush, even in death. With President H.W. Bush’s passing today, we have another slew of newspapers pushing the lie that Bush was so “out of touch” that he was “amazed” by a common grocery scanner. So, even in death, the fake news media continues pushing their favorite lies about people on the right side of the political aisle. Sadly they do not have the class that George H.W. Bush displayed his entire life.